If you have ever driven down the 55 in Niagara, through Virgil to Niagara on the Lake, you have seen Stratus. An elegant looking set of buildings on the right hand side lead into a visually pleasing tasting/showing room (as the Australian’s call it: Cellar Door). In fact, it is one of the nicest tasting areas I have been in. One of the downfalls of such a nice tasting area is (in my opinion, as per normal) inflated pricing. Someone has to pay for the building and the remarkably well rounded staff. Add to the fact that the vineyard itself is on the principle tourist route and you have a recipe for higher prices. Does this affect the quality? Not in any way. J-L, the winemaker, is old school in his direction and skill, with a severe case of quality over quantity. The wine you buy from Stratus is of good quality and you are paying for craftsmanship, not just a label or building. 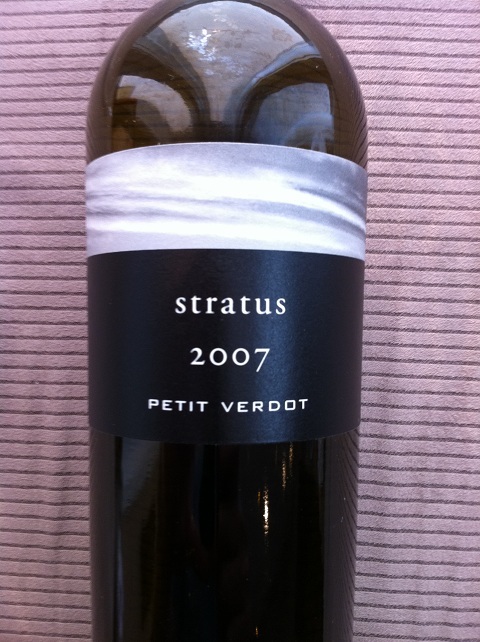 When it was suggested to me to have the Petit Verdot as the wine to drink and review I was excited. Probably the most forgotten of the Bordeaux varietals (some may argue Carmenèrem is) it is rarely found in a regional or Meritage blend, let alone as a single varietal offering. So unique is this wine, should you go looking, you will be hard pressed to tour the wine regions of the world and find more than a handful of Petit Verdot only bottles. So what does this mean? It means it is a challenging grape that matures late and is often no more than an afterthought. What did it taste like you ask? Well it was bold, young and nowhere near ready to show its true colours. A deep, almost blood red colour with heavy red tree fruit nose (think plum and black cherry) will hit you fast and early. Black pepper and licorice will follow the fruit but not overwhelm. Once you begin to drink the wine you will find that the tannins are heavy, the wine is large and you are sure that you should have decanted it for more than the 15 minutes that you happened to have done. The acidity is balanced enough despite the griping tannins and you will experience some chocolate and cassis on the finish as well. Over all this is a bold offering, one which, while good, would not have been my first choice from the vineyard. The Stratus Red is probably the most well round wine, like the child that excels at the 3 R’s while being a 3 sport star; meanwhile the Petit Verdot is the smaller stature gifted artist child with a mean streak, it that requires more attention but is none the less rewarding. Just my 2 cents, Stratus does produce better wines than this, but this is quite interesting, even for $38. The CWG Subjective Rating is 86 out of 100. This entry was posted in Canadian, Wine and tagged canadian wine guy, Stratus, wine review. Bookmark the permalink.